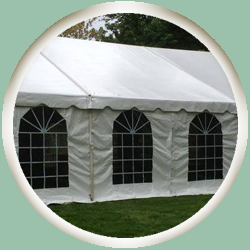 Add sidewalls to your tent to protect your event from rain. These sidewalls wrap the perimeter of the tent and the pricing is per 20' section. For a 20'x20' tent, 4 would be required. For a 40'x120', 16 would be necessary.